How long did January go on for?! I'm so glad it's Feburary already because I really don't like January. This one in particular was a bit rubbish as I was ill for most of it and I didn't get a job I wanted. But hey ho, February is looking better already. I celebrated my best friend's birthday at Bongo's Bingo last week - just go, it's AMAZING - I went to a last minute gig, and this cold has nearly gone. Onwards and upwards, these are my goals for the month. I'm very much in the middle of the 'sorting out my life ' phase, and since I have some time on my hands thanks to #funemployment, I'm taking advantage of it. This month I have two talks booked in to go to, including one with the amazing Emma Gannon and Dolly Alderton, about maintaining portfolio careers - which I am so excited about! These are the sorts of things I wanted to do while I was studying but never could, so I'm constantly keeping my eyes peeled for new events in both Oxford and London. I currently have nothing but a card lined up for Paddy at the moment and we don't have anything planned, but I'm looking forward to another chilled out night on that weekend. 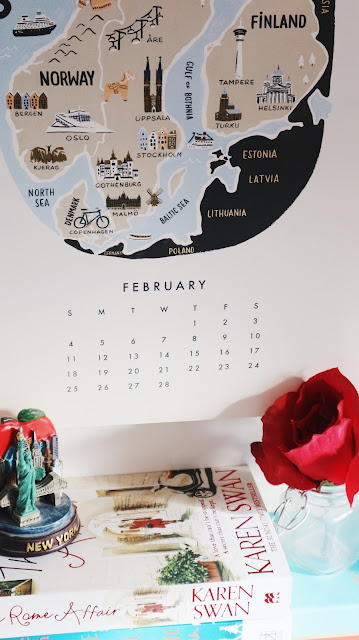 I wrote about our usual Valentine's plans here, and it'll most likely be the same again this year! Present wise I'm on the hunt but want to get something perfect and he's a bit tricky to buy for so wish me luck! I've dabbled in a bit of yoga in the past and really liked it, but I'm terrible at keeping it up. This past month I've really struggled with some health issues, particularly back pain, so I'm hoping to try to dabble more with yoga this month and see if it helps. I've had some stress and fatigue issues too, so I think it'll also be perfect to help me relax too. Pancake day is coming up very soon which honestly thrills me. Annoyingly I'm at a talk the same night, but hopefully I can manage to have at least one on the day if possible! My family tend to make more crepes as opposed to American-style pancakes, and I love either a lemon and sugar or a golden syrup pancake...or both to be honest. An old Valentine's day treat was American-style pancakes for Paddy, so I may well make some as part of his present too! At the moment I'm struggling with this. Aside from my own occasional negative thoughts, there are a few people I know who are either being negative or making me feel rubbish, and I just can't be bothered to be around that anymore. There's already enough going on that my mind is focused on, so I'm being selfish this month and putting myself and my feelings first. I'm not investing in anything that I know is unreliable, I'm doing what I want with no apologies, and no regrets. Who knows, if it works, I'm sticking with it!